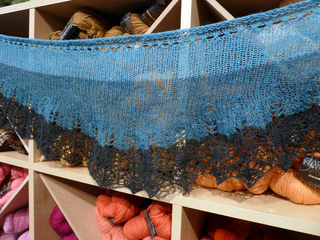 A crescent-shaped lace shawl or scarf trimmed with lace along the outside edge and an eyelet border along the inside edge. 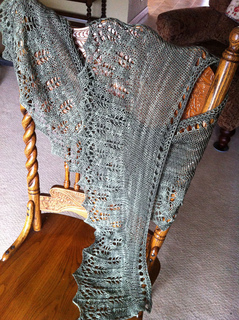 The yarn for the original shawl was handspun from 25 grams each of three different colors. If substituting commercial yarns, 3 shades of the same color are recommended, working from darkest to lightest. 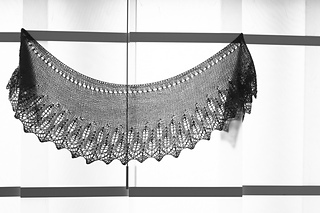 The cast-on is on the outer edge of the lace, and the pattern is worked towards the middle with short-row shaping to create the crescent shape. 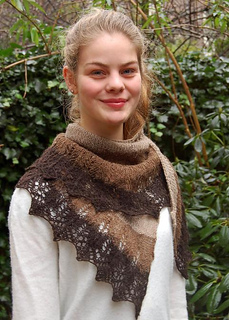 The lace section is a traditional Shetland Fir Cone pattern. The eyelet row and garter stitch edging create a sturdy edge which has textural interest and doesn’t roll. 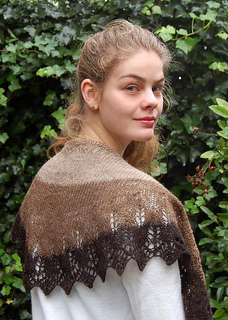 The shape helps the shawl to stay on your shoulders and makes it easy to wear as a scarf wrapped around your neck, without too much bunching and distortion.